Free cancellation 10 days prior to arrival. In case of no show full amount will be charged for the whole stay. Free reduction of 1-3 beds up to 24 hours before arrival. Reduction of greater number of beds must be done up to 7 days before arrival. All booking changes must be done via e-mail. 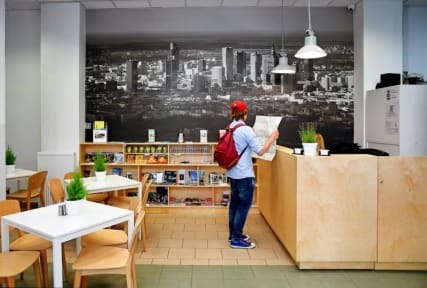 Warsaw Hostel Centrum was supposed to be a bit different, to stand out from the crowds. Our message is: We're Polish and we're proud of our heritage. We'd like to teach you a bit about our culture and history - isn't it one of the reasons we travel? That's why every room and common area is decorated with large wallpapers introducing famous Poles and iinteresting places in Warsaw. You can learn all about it by scanning a QR code - simple as that. Looks cool as well! Obviously we couldn't fit in everything, the Hostel is nowhere near big enough for that, but it's a start. - unbeatable location! Just accross the street from a main Warsaw's landmark- Palace of Culture and Science, few minutes walk to: both airport bus stops, central railway station (Warszawa Centralna) and also both metro lines. - towels for rent (5 złoty). Towels are included with all private rooms. One of the best hostels I've stayed at. It was super clean and everything was very modern. The set up of the bathroom was great. The staff were super helpful and gave excellent recommendations. 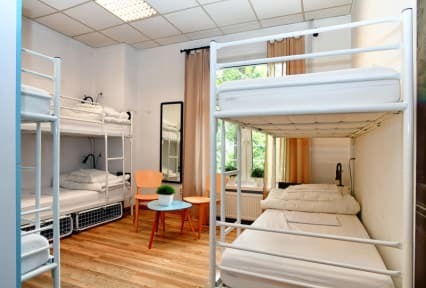 One of my 3 favorite hostels in all of poland. The staff was awsome. Everything was clean the beds were very cizy and A couple of staff were from ukraine and gave me some great info to enjoying its capital to the fullest. Everything was perfect. It was worth staying at the hostel. The beds were comfortable and the staff was really polite. Great location!!! Quite modern and clean rooms. Nice stay for already second time! Ideal place smack in the center of Warsaw surrounded by everything. Facilities were brillaitn nice warm powerful showers, plenty of sinks and hair dryers all so bed were comfortable the staff were very friendly I will definitely be booking here again on my next return thank you! I really appreciate the help that I received from the front desk staff. Thank you and keep up your awesome work. Central location to most of Warsaw's main sights.